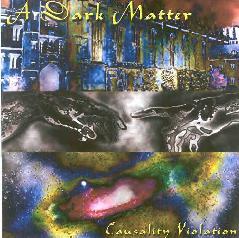 A Dark Matter - "The Harvester" / "Causality Violation"
With these two discs being packaged together, it's tempting to call them one double album, especially when each disc clocks in at just over 30 minutes. But it would be wrong to do that, because the two albums, although by the same band, have a vastly different feel. 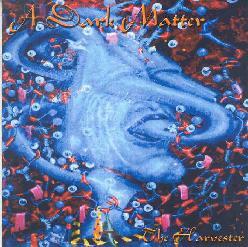 The Harvester is a dark space rock concept album, whereas Causality Violation is more laidback psychedelic pop. The Harvester is based on a short story written by Allen Koser (the story is printed in the liner notes). Considering the style of music, I was expecting some dark science fiction opus, but it is actually a morality tale masquerading as a supernatural revenge story. The album is quite varied musically, with elements of space rock, electronic and industrial music, punk rock, and progressive rock. The tracks are for the most part fairly short (ranging in length from one to six minutes), but in reality, this can be thought of as one long suite, as each song is connected lyrically by the ongoing telling of the story. That's not to say that the tracks are not distinctive of one another. There's plenty of difference between the military-like rhythms and eerie synth wails of The March of the Harvester, the funky industrialism and punk attitude of Wrath in Waiting and the dark and spacey acoustic rock of Retribution Solution. Another nice, if brief moment, is the purely electronic Thoughts Theme, which has a beautiful, soaring, cosmic feel to it. Causality Violation probably, in part, has a different feel to it than The Harvester, because the previous album was largely the work of Chad Hagedorn, playing most of the instruments and writing all the songs, the other members of the band helping out on only a few tracks. Causality Violation is much more of a band effort. It opens up with a sonic freakout of pulsating electronics and deeply processed voices. There are some great tracks on this album, including the smooth and mysterious Dusk Till Dawn, the groovy psychedelic sunshine pop of Slide, and the spacey, Native North American inspired Change of Worlds. My favourite, however, is probably The Genie Project, another great psychedelic pop track with both male and female vocals. Even though these two albums have a different feel from each other, you can still hear the trademark elements of this band emerging throughout: catchy melodic hooks, a nice blend of acoustic and electric guitars, great spacey keyboard work, side trips into experimental land, and definitely intriguing lyrics, even on the lighter pop numbers. The albums come together or separately, as nicely packaged CD-R's, with flippy cover art (though I must admit, the text on the back and inside covers of The Harvester is often difficult to read... but not impossible). If you want your psychedelia with a darker, space rock edge, check out The Harvester; if you want it groovier and laidback, check out Causality Violation. Better yet, check them both out. You won't regret it! For more information you can visit the Grey Slade web site at: http://www.greyslade.com. Contact via snail mail c/o Shades Of Grey Records; Attn: Chad Hagedorn; 5040 S. "M" St. Tacoma, WA 98408.